One of the big problems with this film is its overdependence on old gags. The lazy writers seem confident that we won’t complain if they stuff the film with jokes that we enjoyed the last time around. But I’m not paying three hundred bucks to watch Carrey blow mouth spray in the wrong direction again, or to watch the two men smell each other’s farts repeatedly. I’m going with one-and-a-half out five for Dumb and Dumber To. It’s awful in so many ways you’d have to watch it yourself to realize just how low the bar has fallen. But please don’t. Jim Carrey fans may well rejoice, for the rubber-faced comedian is back, and channelling his entire range of comedic tricks. Less funny but somewhat goofier. Save some potty jokes, the plot is essentially a vehicle for a bunch of sight gags and situational comedy all strung together. Carrey is a natural – he often sounds like he’s ad-libbing and Turner’s dour one-liners delivered in her nicotine-roasted voice is genuinely funny. The jokes are definitely ‘dumb’ (and therefore, it works in this film’s context), but with a movie title that literally proclaims the same out loud, what can you expect? Dumb and Dumber had an easy flow. 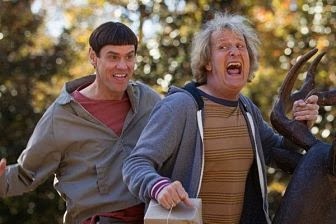 Dumb and Dumber To seems to be desperately trying to carve out an audience for itself in a world that has moved on. Harsh as it may sound, Dumb and Dumber To seems to have been made purely because the studio needed to dish out something and this was probably the least-worst option. Stale and struggling to remain relevant, Dumb and Dumber To doesn’t manage to be good enough to be applauded or bad enough to be laughed at. There are a few bits that make you laugh. But like everything else in the film, they never really materialize.Watch this film only if you are a fan of Jim Carrey and Jeff Daniels, and would love to see them again in roles that made them famous. The comedy isn’t fresh, but you will laugh at some parts. Don’t go with high expectations and as is the trend with most comedies these days, ‘leave your brains at home’. That should work.